For this, and other reasons, I think buying December 2012 Treasury Bond puts could turn into one of the biggest bond trades ever. Of course, this is only my opinion, and if I am wrong you could lose every dime you spend on these puts, but I honestly think there is NO WAY Treasuries will be trading above the 130 mark (17 points from here) when the December contract expires. As I have written many times, by the time you can read the Fed intends to begin raising rates, the Bond market will probably have already dropped 10-15 points ahead of the announcement…I would also add, when they do finally indicate their low rate policy is no longer needed, the Bond market will probably trade an additional 10-15 points lower beyond those levels. We’ve just gone through another week of Eurofears…Having seen it on countless occasions the past 30 years, I am telling you the “flight to quality” game has been played to the hilt…and is now OVER. Europe ain’t dying. Every monetary and political official on the planet is working to keep everything functioning…AND THEY WILL. The “crisis” is history. I believe the so called “safe haven” in Treasuries is going to turn into a financial bloodbath. Get short the Bond market now…I am buying both September and December puts…I think Treasury Bonds could easily be at 130 before we get to August. I am pretty sure the nation’s Corn producers are beginning to get nervous about all the Corn they have stored while “waiting for higher prices”. 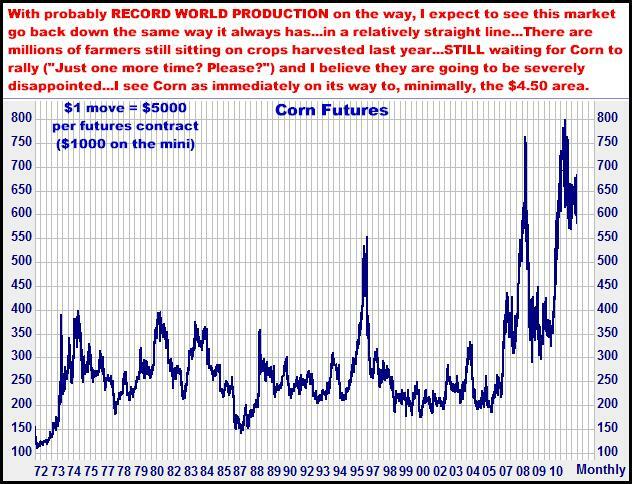 A record world crop is most likely on the horizon, and every 10 cent drop in prices (down 23 today) must have more and more of them thinking, “I need to get this stuff sold”. FOR THE NEXT FEW MONTHS, THIS IS MY SCENARI0: I FIRMLY BELIEVE CORN USERS (BUYERS) HAVE DONE ALL THEIR BUYING…WHILE CORN PRODUCERS (SELLERS) WILL BE SHOWING UP IN BIG NUMBERS, EVERY DAY TO GET THEIR CROP SOLD…AND THIS IS THE RECIPE FOR A STRAIGHT DOWN SORT OF COMMODITY MOVE. I think these are two fantastic trades…DO something with them…Sometimes this game involves a lot of pain, and waiting for what seems like forever, but when the trade IS there, you have to pull the trigger and NOT pass on the potential opportunity.